Works are now well underway on another West Yorkshire project, installing an affordable partitioning system to build practical office spaces. Our West Yorkshire client requested Rodley Interiors to create additional offices to their existing work space. The partitioning needed to match the existing but also be affordable as our client was working within a budget. The partitioning we chose to install was a 50mm Tenon Flex Plus system. This affordable partitioning system is ideal for any growing business. The product is fully demountable and can be re-located to suit changes in business needs. The partitioning can be manufactured in a wide range of RAL colours to suit the colour scheme of your office. We chose to mirror the look of the existing partitioning by proposing to install floor to ceiling height double glazed units. To keep levels of privacy the glazing will feature 25mm integral blinds within the cavity of the glass. The blinds could then be adjusted to suit. Each office was fitted with Ash veneered doors and a long feature door panel. 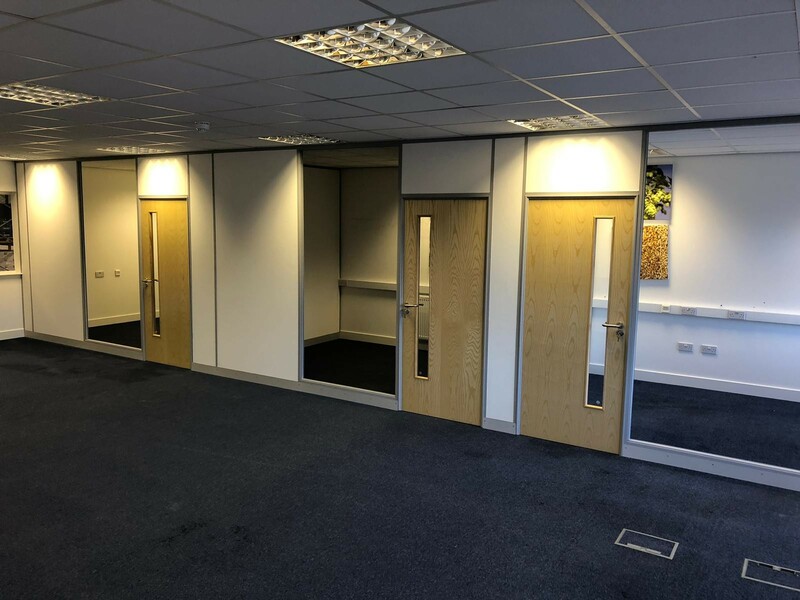 With the double glazed windows to follow, this affordable partitioning system not only looks attractive but is of high quality and a high specification.